Egypt's Paralympics team arrived in Cairo on Monday to crowds of supporters after winning 15 medals and breaking a world record at the London 2012 games. However, despite ranking in the top-30 since the 1990s, the Paralympians' efforts usually spark little interest. Ahram Online spoke to silver medallist Ibrahim Ahmed Abdel-Wareth and javelin and discus contestant Ibrahim Ibrahim, 38, outside the Olympic park in East London, shortly before the team returned home. "We have got four gold, four silver and seven bronze medals, 15 in total, which is three better than the 2008 Beijing Olympics and much more than this year's Olympic team who got just four," Abdel-Wareth told Ahram Online as he took a break in the nearby shopping mall. The shot-put competitor, who is only 23 years old, participated in the Olympics for the first time, managing to win a silver medal. "We were hoping for another two, but, sadly, we missed those opportunities," Abdel-Wareth said. Four years ago, Egypt secured 12 medals, a significant drop from the previous Olympic Games, which saw the team take 23 in Athens and 28 in Sydney. Ibrahim said government support for the Paralympics team had been at an all-time low before the 2008 Games and that last year's 18-day uprising interrupted training. "However, things have got better after the revolution; we have more options – the new government has shown greater interest in sport and in us," Ibrahim said. "They said they promised to invest more money in training and in training camps, for example." The Egyptian Minister of Sport El-Amry Farouq, who was at the airport to greet the team, told state news agency MENA on Monday that they had increased rewards by 130 per cent. "Gold medallists will receive LE300,000 and the silver medallists will receive LE180,000," he noted. Whether greater investment in the Olympic and Paralympics teams will happen in time to make a difference for the 2016 Rio de Janeiro Games has yet to be seen. "Before this year's games, the state's efforts to support our sport happened very recently; we had a very short timeframe to translate that into training, so we have tried to do what we can and be very focused," Ibrahim said. "Like I said, the government has promised money in the future, so we will see." For Ibrahim and Abdel-Wareth, equipment is at the top of the agenda. During the London games, there was a huge controversy over the equipment used by different athletes, creating, according to some, an unfair advantage for those hailing from countries that could afford to invest in complex technology. South African sprinter Oscar Pistorius, favoured to win the 200-metre race, complained, after losing to Brazil's Alan Oliveira, that it was an "unfair race," as Oliveria's blades were too long, allowing him to take extended strides. Athletes are set against each other according their disability, not by their kit. The Olympic repairs centre, which was run by German prosthetics firm Ottobock, fixed wheelchairs, prosthetic limbs and support devices for free, but found they were also handing out new equipment to poorer countries. "We do experience athletes coming from developing nations with products that are very old," Ottobock spokeswoman Anna Parisi told AFP on Wednesday. "It's often easier for us to replace rather than repair." AFP reported that one such replacement was a wheelchair from the Egyptian national team. It is interesting to note that Egypt exclusively won medals in events that do not rely on wheelchairs or prosthetic limbs, such as power-lifting, shot put, javelin and discus. The Egyptian Olympic committee skimped on equipment to such an extent that, despite signing a contract with Nike, the team's sports kit turned out to be fake: "It was a mistake of course," Ibrahim admitted, "but, to be honest, it was very embarrassing for us." "This kind of behaviour was normal under the old regime. Under Mubarak, it was ridiculous," Ibrahim said, adding that he had gone to Cairo's Tahrir Square on 10 February 2011, despite the crowds, and refused to leave until Egypt's former president stepped down. "But after the revolution, we really thought we wouldn't be dealing with these kinds of problems again," he said. Aside from the issue of funding, both Ibrahim and Abdel-Wareth talked about the social stigma shown towards those with disabilities in Egypt, contributing to the problems they and the sport have faced. Ibrahim, who grew up in Banha in Egypt's north-eastern Qalioubiya Governorate, described catching polio at two years old and having to deal with living in a city of broken pavements, poor lifts and no ramps. Ibrahim is not the only member of the team crippled by polio, the illness that became a major issue in Egypt in the 1970s and early 1980s. "It has been really hard growing up in Egypt with a disability," Ibrahim said. "Since I was born, there have been no facilities, no one to look after us, it's extremely hard to be mobile – just to go down the street can be a struggle. Even the capital is not built for someone in a wheelchair." "I haven't had as hard a time as Ibrahim," explains Abdel-Wareth, who grew up in Cairo's working-class Shubra district. "One of my legs is shorter than the other, which means I still have some mobility. I don't know how he copes." Both of them wished that that greater provisions had been made to make their lives easier. "Just small changes would do a great deal. For example, if there could be larger pavements for us, wider doors, like they have here in London. Being here for the Games, I can pretty much go wherever I want, do whatever I want – I wish Egypt could be like this," Ibrahim said. He explained how he had started his career as a javelin and discus athlete because of the independence of the sport. "I don't have to rely on anyone, like if I was part of a team sport. If I want something, I go for it." They both explained that, since President Mohamed Morsi took office, a committee for the disabled was set up to look after the community, to assess their human rights and to investigate possible policy change. "We hope something will come of it; before, there was nothing like this in place," said Ibrahim. "Now we have someone to look after us, listen to our grievance and, hopefully, act upon them." However, the biggest struggle is changing public opinion. "I think it's going to take years, at least fifty, to change people's perception of us and to finally appreciate what we, as Paralympians, do," Abdel-Wareth added. Both Ibrahim and Abdel-Wareth agreed that there had been record-breaking crowds at this year's Paralymipc Games as London had doubled its efforts to publicise the events, which could help garner interest back at home. The crowds at the airport and the promise by the sports minister that the medallists would meet the president already reveal a possible shift. "In future, we would like watching athletics, and Paralympics sport, to be as normal as watching a football match," Ibrahim concluded. "We hope that people won't only take a greater interest, but will be inspired to get involved." 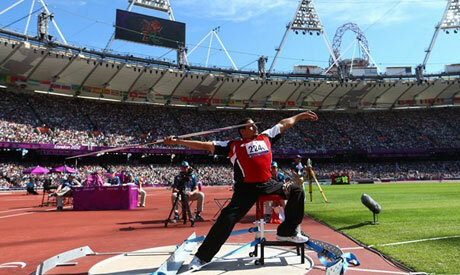 Congratulations to the Egyptian Paralympian contingent for winning 15 medals at the London 2012 Paralympics. I think that it's a big achievement considering some of the things mentioned in the article above, such as the lack of facilities for the disabled in Egypt, which in turn makes it very difficult for the disabled to live independently. But there's hope now as Egypt begins a new phase with President Mohamed Morsi at its helm. I think the future holds many good things for the disabled and the Paralympian athletes. Mabrouk to all the Egyptian Paralympians! Egypt should be proud of its Paralympian athletes. To have a disability, no proper funding, no functional facilities to train and no general awareness to act as moral support and yet they win this many medals...I salute you.